-1st shift. Geno looks like he's in "I'm going to try to do everything" mode. This can be a good or a bad thing. -Pens answer with 2 straight shifts of puck possession. Last year's dynamic 3rd line playing as line 2 tonight and they're picking up where they left off. -Lucic and Savard each with point blank shots at Fleury but Flower keeps the puck out of harm's way. -Rupp and Conner together on the ice certainly bring an interesting mix. One is crushing and one is flying. 25 in the middle. -Great skating by Malkin creates a nice chance for Kunitz. Just a hair wide. Halfway through the 1st. -Jeffrey off for a hook. Soft call if you ask me. -Staal with a nice looking shorthanded breakaway but poke-checked away by Rask. -Rest of the PK goes smoothly. Guys look like they came out to do work tonight. -Staal with a nice shot. Boston is keeping a lot of traffic in front of Rask and it is causing for some interesting scrums in front of the net. -Cooke off for high-stick. Another picture perfect penalty kill. -Pens end the period on a powerplay. Looked nothing like an advantage until a doorstep chance by Letang as time expired but Rask met the challenge. 0-0 after 1. Notes: Overall it was just a hard fought period by 2 of the best defensive teams in the league. Can't be upset with the way the Pens came out after watching Saturday's disaster although still no goals. These lines look like they are working well together and as usual the penalty killers are phenomenal. I know this sounds like a contradiction, but I'd actually like to see a bit less work down low/puck possession and a bit more shooting. -Geno goes forward on the faceoff and finds a streaking Letang. Rask is ready for it. -Pens get another chance on the powerplay. Starting to find a bit of success working it out to the points, but still no dice. -Paul Martin's ridiculously lazy turnover behind his own net leads to a few chances for Bergeron but Fleury bails his dman out. -Good hustle by Kunitz and Dupuis leads to the game's best chance so far. 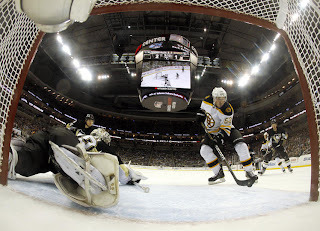 Also the game's best save by Rask. 12 min to go. -24-11-48 line with a massive shift at midway. -Some confusion when Fleury goes behind the net to play a puck and it almost ends up like the Winter Classic goal. But thankfully it doesn't. -Fleury with a huge save on Lucic. Closed the 5 hole just in time to preserve the 2 goal lead. Some fireworks after the play between Letang and Savard. Rumor is that Savard had a hangnail. -Recchi takes a 4 minute penalty. Pens hold the puck too much and don't make much out of their 4 on 3 chance. When it turns to 5 on 4 the Bs go to work with some shorthanded chances and it leads to a Goligoski penalty. -Period comes to a close 2-0 Pens. -3rd starts out like the last 2....Defense. -One thing I'm noticing about the D tonight is that they are working very well with each other. All 3 pairings showing good chemistry tonight. -Orpik and Wheeler really get into it behind the net. -I'm hearing Talbot struggled down the runway but he returned rather quickly. Probably equipment. 13 minutes left. -Boston picking up the pressure but so is Fleury. Still 2-0 Pens with 11 to go. -Boston kills off a Pens PP. They are gaining some momentum with 6 minutes to go. -Orpik called for boarding...meh, I guess. Anyways, its a big powerplay opportunity for Boston in the last 5 and a half minutes. -Here we go again... Boston scores again. Marchant had the entire net to shoot at after a delicious Fleury rebound. Fleury looked like he was either frozen in place or sleeping. -Bylsma timeout. Why does Boston do this to us? Regardless, the Pens have been the better team tonight so they can bounce back from this. -Now Staal in the box. Boston with a powerplay to do take the lead. Do or die penalty kill without one of our best killers here. Gut check. -Recchi given all the room in the world in front of the net. And he scores. -And why not? An empty netter for Boston too. Notes: I have no words other than every single black jersey should be ashamed and disgusted about this game. There is no excuse for that kind of sloppy play to happen in the ECHL, let alone the top level of hockey. And even though the Pens were outplaying the Bs essentially all game, there were a lot of people (myself included) who just felt this coming. Its just a shame that the HBO series ended because this will be a very interesting locker room postgame chat. Final Thoughts and Notes: I will not erase and allow my comments on periods 1 and 2 to remain in the post, but right now I can say nothing further positive about this team tonight. They don't deserve it right now. -However I will not waste your time with mindless rage either. It was exactly what it sounded like tonight. 1 embarassing loss is a hiccup, 2 is an eyebrow raiser, but 3 is a problem so they better start AND finish better on Wednesday.